We are so excited to be hosting another Disneyside party this year. For the most part we will be keeping with the same theme but we are still awaiting our box of goodies so that will change. I have started making our DIY Mickey Mouse Invitations but thought we would add a few new decorations into the mix. After making this Valentine’s Day Wreath I got a touch of the crafting bug and created this Mickey Mouse Wreath for under $5. It took less than an hour and it is simple but screams MICKEY. 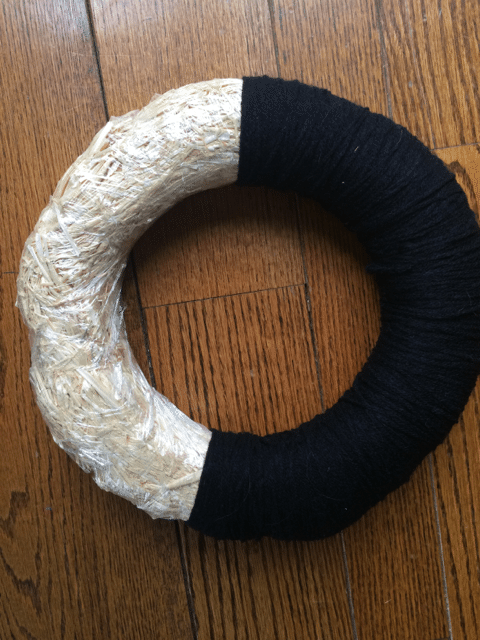 Staring with the Black carefully wind it around half of your wreath. 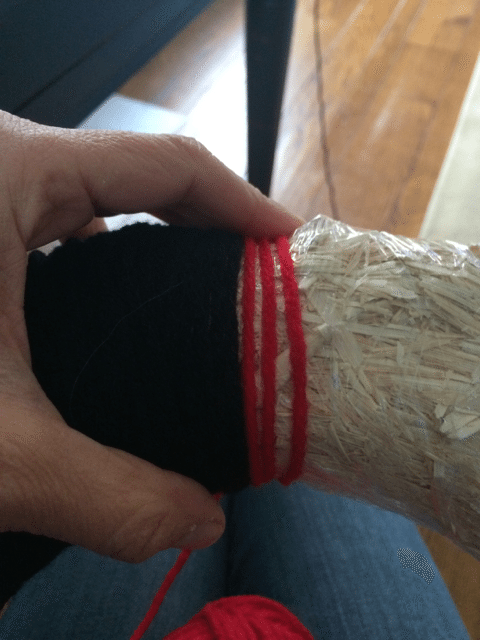 Trying to keep the yarn spacing as evenly as possible. There is really no wrong way to do this. I found it easiest to keep one finger near the looping. Be sure to pull it taught. Go backward and fill in your spaces, being sure not to miss anything. 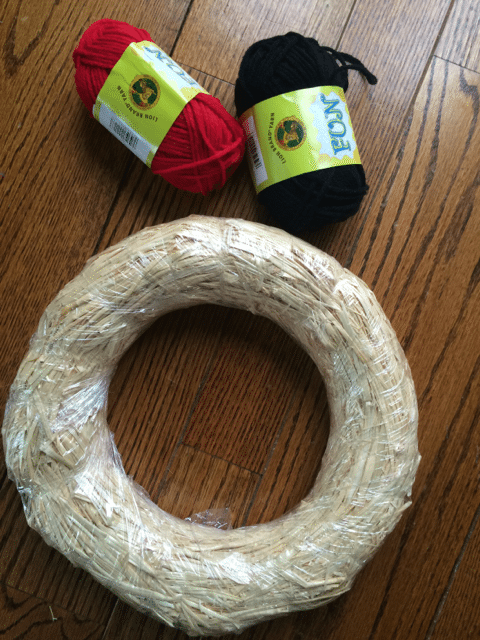 Tie it off in the back or you could use a glue gun to adhere it to the back of the wreath. Repeat with the Red Ribbon. 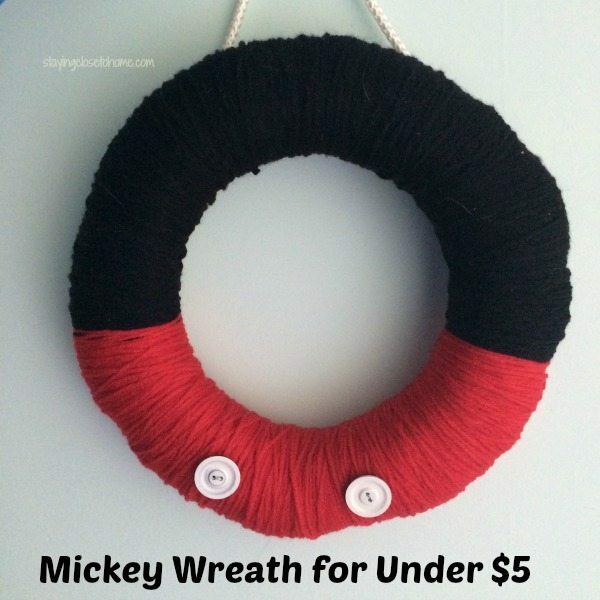 Add your Buttons with glue to really show off your Mickey Mouse Wreath. 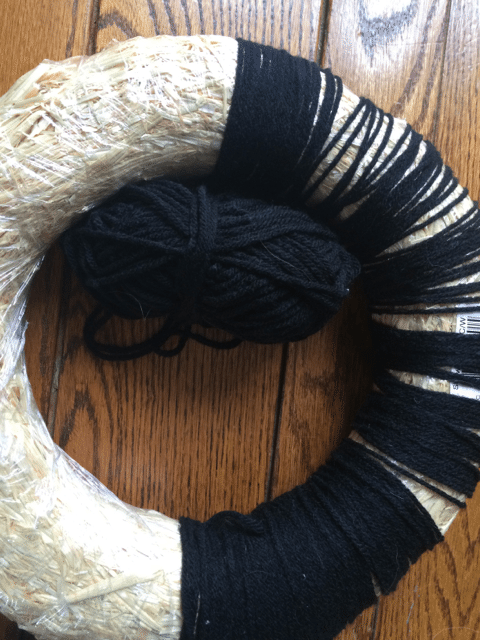 With your black ribbon make a wreath hanger. 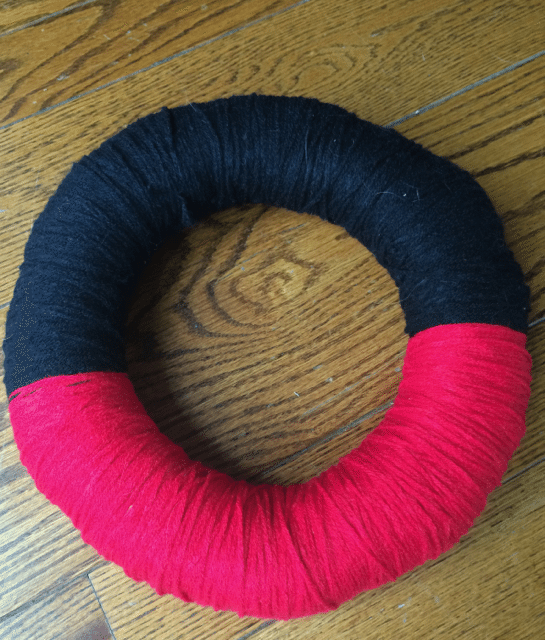 If you wanted to do Minnie Mouse wreath, I would add a bunch of small white buttons to the red and make a red wreath hanger. I told you this was such an easy craft and you can make it as small or large as you need. We decided not to add any ears as we like the simplicity of the wreath. Be sure to check out our DISNEYSIDE party ideas from last year. So how do you plan on showing your Disneyside this year? This is such a good idea! I might just have to make this for my niece, she love mickey and minnie! That is such a cute idea. I will also be doing a Disney Side party this year. Such a cute wreath! And while it’s definitely Disney, I love that it doesn’t scream Disney with the ears and all that, either. What a cute idea! Perfect for a Disney party! What a great idea! This is the perfect craft project for my Troop. They can even earn a badge with this project. I love that it is inexpensive and easy to make. It does scream Mickey all the way. I love it and so with the girls. It is so adorable I would proudly hang from my front door. Thanks for the project. Not only with it be a hit but it brings a smile to your face! This is such an easy and cute idea. I will need to be doing this as a decoration in my daughter’s room. She is addicted to anything Mickey and Minnie inspired. How cute…thanks for the tutorial. This looks easy!! Could I do it? Really cute idea! Great idea! Those iconic colors are so recognizable, the sign of a great brand! I painted a cabinet red and black not long ago, and when I put the white drawer pulls on, it’s screamed Mickey! You might need permission from Disney because these are just way too good! Looks easy to do as well! Very nice! What a cute idea!! And looks easy. Now, that is really cute! What a clever idea! That is a nice touch of happy for the house. I love MIckey Mouse. What a really cute idea, a great way to get you into the spirit! What a nice easy craft! So adorable and easy for any Mickey Mouse fan to make. Nice, fun and easy! Great idea! Oh what a cute idea! Looks simple enough to make, too! Thanks for sharing! Well, I love making Disney decorations with the grandkids. So much fun. Like the wreath. First i’m taking a weekend trip to Disney. then i’m coming home and trying to make this. I used to make a wreath for every season or holiday. I haven’t done it in a long time but I really want to make this one. This is a really cute idea! I think even my girls would love making this! That is way too cute. What a clever idea.